My quilting story began when my Mother made me make a doll quilt for Jr. Grange as a 3rd grader. It was hand done. I didn't re-visit the craft until friends took me to Mystery Quilt sessions at a local quilt shop early in 2003. When my blocks looked wrong, I learned not to use 5/8" seams!! After attending the 2009 AQS show in Knoxville, I joined The Village Quilters, took Quilting 101 as soon as possible and began a new fulfilling hobby. Serving as President in 2017 was a great experience. I learned that 350 members are all very creative, eager to serve and very giving. Over 750 quilts were donated through Community Service, QOV, Newborns in Need and the June Challenge quilts that were made from scrap bags from Community Service. We wore Easter Bonnets in April and in September we had " D Day" to celebrate the 500th donated quilt, donuts and the Dude, Rob Appel, our speaker. In October we had a special QOV recognition celebrating our members who have served in the military. It was a fun,fast and fulfilling year. I had the pleasure of serving the Village Quilters as leader during the guild’s 20th year. During the year, we took time to celebrate our members and all the good works they have accomplished. Our mission of service to our community while educating our members has been our beacon for the past 20 years and it will carry us into the future. Before moving to the Village in 2011, I lived in a number of places east of the Mississippi River including Chicago; New York City; Philadelphia; Clinton, Iowa; and Troy, Ohio. My mother taught me to sew on her Singer Treadle and my high school home economics teacher taught me to convert to an “electric” Singer. I’ve been quilting as long as I’ve had children - and that goes back a while! Jerry and I enjoy visiting National Parks and Frank Lloyd Wright houses as we travel from Boston to Michigan, Ohio and North Carolina to visit our daughter and three sons with their families. In Michigan, prior to moving to Tellico Village, I would read in the Tellico Connection the monthly news reports, all about the Village Quilters and what they were up to. In January 2003, the guild was the first group I joined when Tom and I retired and moved into our new home in Kahite. I was new to quilting, but I knew I wanted to learn and be a part of this wonderful and talented organization. I joined in and started attending the monthly sweatshops and met so many friends and quilting teachers at the workshops and classes offered each month. I became leader of Community Service in 2011 and continued for two more years. In 2012, Kathy Fisher asked me to join her 2013 board as Vice President. Serving as President in 2014 was one of the most rewarding and fun times of my life. The 2014 Quilt Show and Boutique was fabulous and the entire membership pitched in and made it the best show ever. I was both happy and sad to see my term of office come to an end, but I am reminded by so many guild members what a great time we had together. Now in 2015, I am back to my "roots" serving the guild as leader of the Community Service Team, which is a totally awe-inspiring place to be. My many thanks go out to the members of our guild who never fail to support and give so generously to any requests for assistance. Having so many very fine friends in our small little world of quilting is wonderful and my life is just a little better knowing all of you. 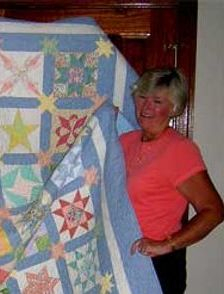 I started quilting when we moved to Tellico Village from Rhode Island in 2007. The first workshop I took was making a purse and I thought I was way over my head. But in typical Tellico Village fashion, not only was I made to feel welcome, but I was given all the extra help I could have possibly hoped for by instructor Suzy Dale and other class members. And I was off and running. Next I took Arliss Barber’s Quilting 101 and I was hooked. When Jackie Trombly asked me to be Vice President in 2012, I had no idea how interesting being a board member would be. There is so much more that goes on behind the scenes than I ever realized. I became President in 2013 and had the privilege of working with an amazing group of women. 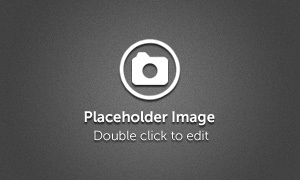 I think the most thought-provoking project I worked on was the development of the new website after Diane Rhea, the webmaster, announced that she was moving back home. 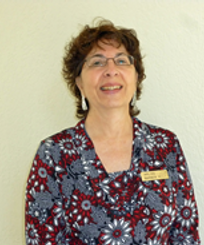 I designed and implemented the current website and turned it over to board member Barb Gothard, who became our new webmaster! 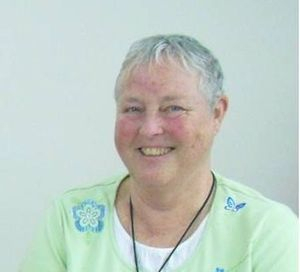 Jackie Trombly, 2012 Guild President. 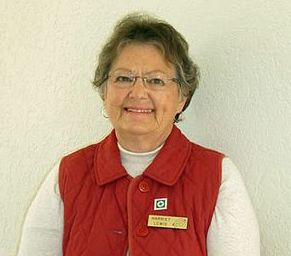 Jackie’s love of quilting began just prior to moving to Tellico Village in 2006. She has continued to grow and learn through the workshop and classes offered each year. Jackie is inspired on a daily basis by the marvelous talent of the women in the Guild. 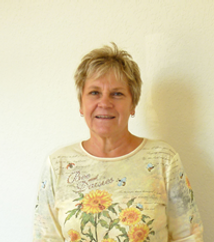 When she’s not quilting, her hobbies include traveling, golfing, and boating with husband, Rod. 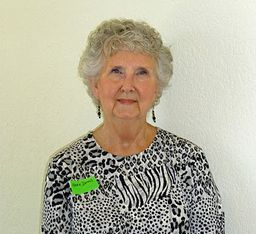 Joyce moved to Tellico Village in January, 2007, after living in Valparaiso, IN, her whole life. When her husband, a high school English teacher and coach, decided to retire, it had to be somewhere he could play golf year round. Tellico Village was the perfect place! Joyce’s mother introduced her to quilting in the early 1970’s. Her first full size quilt, a log cabin, is still not finished! 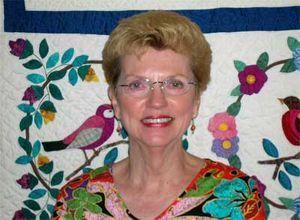 After helping her mother hand quilt several quilts for family, Joyce put down quilting while helping raise their boys. 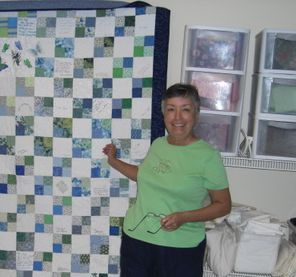 She was excited to find the Village Quilters and joined (actually a year before they moved) on the recommendation of Terri Ayres, whom she met at the old Sweetwater quilt shop. 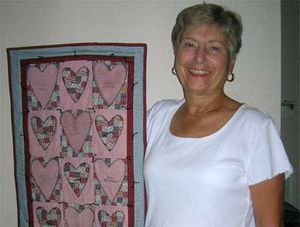 Joyce’s special love is quilt history and recreating historical quilts so she helped Jan Wass start the History-Holics Bee. But the VQ Guild has opened up so many new areas of quilting that she finds it hard not to try everything. She recently compiled a list of PHDs (Projects Half Done) and has nearly 40! She is so thankful for the talented and friendly members who willingly share their knowledge and help with individual and Guild projects. The Guild was incorporated during 2011, a process begun in 2010 and completed in 2012. The Guild also celebrated Community Service donating over 2,000 quilts since its inception in 2004. Having the opportunity to be the President of the Village Quilters was wonderful. The year was jam packed and for me it flew by. There is so much talent in the group and such an atmosphere of camaraderie among all the members. A special part of the year for me was the Guild Challenge that was dedicated to “Quilts of Valor.” Introduced to us by Kate Meyers and MJ Sepples, it was a great cause embraced by many of our members. We were touched by it so much that our guild is still making and distributing Quilts of Valor. After the superstar, super-show year of 2007 I thought 2008 would be a little less busy, but there was a big announcement in February about AQS coming to town for their national quilt show in July of 2009, 2010 and 2011. Threads of a community service related conversation at that news conference led to the opportunity of a lifetime for the Village Quilters—the chance to make an artistic quilt to commemorate the Knoxville Convention Center's new relationship with AQS, plus showcase East Tennessee quilters. Under Tennessee Skies now hangs at the Convention Center and will for a long time to come. Several months later, AQS asked our guild, as well as the Smoky Mountain Quilters, to act as the volunteer guilds for the show. Another multi-year project, which was quite an adventure, finally came to fruition in the spring of 2008 with the grand opening of the remodeled rooms at Chota Center. We finally were able to move in around the middle of April that year. We also were able to greatly expand our offerings of classes and workshops as well as group Bees and free sewing time. The joint Quilt/Art Room features include expanded space with extra lighting plus a large design wall, making it a wonderful environment to develop our talents. In addition, we acquired a permanent storage space for our growing Community Service inventory. In the fall we had our bi-annual quilt show. Through the efforts of many, the show continues to grow and it was again a tremendous success. I truly enjoyed serving as president for 2008—we had a great group of people serving as officers and committee heads. I couldn't have done it without them. Thanks for a super year. Jim and I moved to our beautiful Tellico Village in August 2001. I soon found the wonderful ladies of our quilt guild that good friend Carole Spanh formed. It was considerably smaller at that time and we met in the Rec. Center. It was a little tight. As the guild grew and moved to various locations, the spirit of giving and loving our art grew with us. The year 2007 was quite an active one. A group of 5 members on the Rec Center committee worked with the POA developing the Quilt/Art room that we enjoy today. It was quite an adventure, and everyone who utilizes this space loves it. With the lighting (we can actually see) and space, it is a wonderful environment to develop our talents. One of the highlights of the year was the Ricky Tims Super Seminar. Guild members worked very hard for 3 years to make this dream come true. It was held at the Knoxville Civic Auditorium in September, for three days. Along with Ricky, Alex Anderson and Libby Lehman were the presenters. We also had “Bob the Thread Guy” from Superior Threads to demystify thread and its uses. This seminar and all the fun it entailed was the best I have ever attended. Many of the “girls” stayed downtown and had a ball. Because of this success, the base was laid for AQS coming to town for their big July quilt show for 2009, 2010, and 2011. (Thanks Ricky for your letter of recommendation for Knoxville). The memories and friendships formed will last a lifetime. 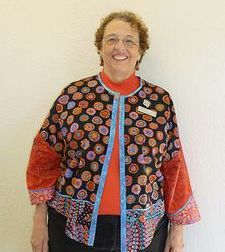 It has been my pleasure to serve as president for the 2007 quilt year, with my wonderful board and committee heads. This guild never has to look for volunteers. Just ask for anything and hands go up. Thank you for a wonderful year. I began quilting 25 years ago, but work got in the way and so until I moved to Tellico, I suspended quilting. When I arrived and finally got my own sewing room, I really had to relearn many things. Fortunately, I still had a stash of fabric to work with. I am a very traditional quilter and I love working with pastels. My new love is hand appliqué. I can sew and stay awake watching TV. I have sewed all my life starting with making most of my clothes, but now quilting and quilting with friends is my great joy. I was president in 2006. I joined the guild in 2001. During my year as president, we changed our meeting place from the Yacht Club to the Lutheran Church. We also held a very successful quilt show, more than doubling attendance. Ginny brought us the news about our being the sponsoring guild for the Ricky Tim's seminar and we happily agreed. When we moved to Tellico Village in January 1998, I was happy to find a quilt group existed. The first meeting I attended had about 20 quilters and 5 Board members that sat at a table across the front of the room. Several months later, I was asked to plan a Quilt Show. I borrowed 8 or 10 racks from Smokey Mt. Quilters, and everyone brought in what they wanted to show. Members gathered up small quilts and randomly pinned them all over the walls. And the Show was a success. In 2005, I became president and we had grown considerably, to about 175 members. It was a Quilt Show year, but with more planning and committees. We had more racks and quilts, and more work - but still fun. We took in more money and membership grew - and we reached the point where we had to change. My presidency was the last of what I call the folksy guild meetings on the upper level of the Yacht Club, with casual chatter and poems. 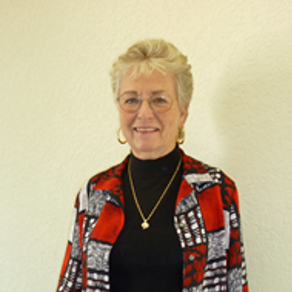 We needed a larger meeting space and more organization - all of which Joanne found for us the following year. I remember 2005 as a year of working with a friendly and enthusiastic membership, and I look with pride at the President's plaque that hangs on my sewing room wall." When we first came to America in 1986 (for 6months! ), I joined the local “Newcomers” group. There I met a lady who had been a member of that group for more than 30 years! 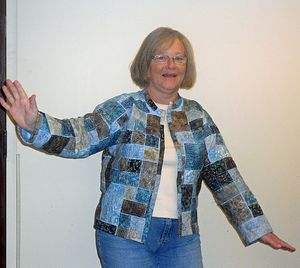 She was a retired teacher and a wonderful quilter. That was how my love of quilting was born. We returned to England in 1987 and I found the British Quilters Guild. I was introduced to a local quilt guild and eventually joined them only to find after 8 months back in England we were returning to America for 3 years. Back in Michigan I joined the Tri County Quilt Guild and spent 10 happy years quilting and making new friends. By 1997 my husband, Dave, was approaching retirement and we made the monumental decision to stay in America and became American citizens! When looking for somewhere to live in retirement (Dave said ”Not one more Winter in Michigan!”) we found Paradise A.K.A. Tellico Village. We built our house and moved here in May 1998 and the first things I did was join the golf league and the newly formed Quilt Guild. The Guild then was only small and we met at the Rec. Center. Eventually, as the numbers grew, we moved to the Yacht Club. In 2002 I was elected President of the Guild and it was fun year, for me anyway! The things I remember most about that year are the great quilt show and the “Pentagon Flags”, our first contribution after 911. I will forever be grateful for the opportunity to be President and I still enjoy the guild to this day. 2. Partnering with the Farragut mayor's wife to put together a quilt show in Farragut. Things were a lot slower back then and we were meeting in a small room in the rec center. We did not do President's quilts at that time. I have been quilting about 20 years. I saw a quilt kit in Good Housekeeping magazine and ordered it. This was the first quilt I ever made. I continued to quilt, but I had little time due to working and traveling a lot for my job. Once I retired, I began making more bed quilts, but I enjoyed the smaller quilts that I could piece and quilt by myself. I am a machine quilter and rarely hand quilt. I guess that is why I enjoy our sweatshop sessions so much. I am married to Tom. 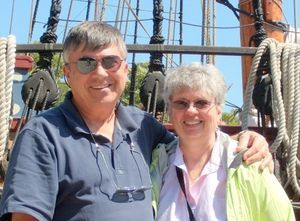 We have three daughters and one son and seven grandchildren - 3 boys and 4 girls ranging in age from 15 to 3. We have lived in the Village since May 1993. I was born and raised in Cincinnati, Ohio. We lived in Detroit, MI area for 15 years. The rest of the time we were in Cincinnati until we moved to Tennessee. My interests besides quilting are: my family, golf, bridge, poker and reading. My only sewing experience was a stretch 'n sew class back in the 70's. I made tee shirts for all of my children, my husband and myself. I tried to make skirts and vests for two of my daughters for Christmas one year. The zippers got me. They went in a bag and I gave them away about 10 years later still unfinished. And my sewing machine was retired except for some mending. I have always loved quilts. My first quilting experience was in the 80's in a suburb of Detroit, Michigan. I took a class at a quilt shop and made a small sampler quilt which included six blocks and a border. When it was finished and the class was over, the teacher said take it home and quilt it. Since I had not a clue as to how to begin to quilt it, it sat in a closet until my first grandchild was due. I then took it out and quilted it the best way I knew. My next venture was another class in the early 90's in Cincinnati, Ohio. I took another class and made a quilt for my second grandchild. I actually finished that one the same year. My first winter in Tennessee, since I was not golfing, I made a quilt from Leisure Arts magazine, which was a plain white fabric with a sashiko pattern about 20 by 30. My daughter loved it and asked me to make her a crib-sized version for her baby who was born in '96. I did it, but it was very difficult doing this in a larger size. In 1995, Rita Fritz, Jill St. Ives and I took a quilting class from Allison at the Quilting Corner in Oak Ridge. It was a sampler quilt, hand pieced and took about a year to finish the top. Mine was queen size and every piece including borders was cut out individually and hand pieced. Twelve years later, last week, I took it to Kathy Drew at Gina's to quilt for me. I wanted to hand quilt it since I had hand pieced it, but after basting it, and starting to quilt it, I knew I would not do it justice AND I wanted it finished in my lifetime. Rita, Jill and I had such a good time doing this project, I wondered if there were any others in the village who enjoyed this hobby. I had never belonged to any kind of quilt group, but I thought it would be fun to share this activity. After putting an announcement on Channel 3 to see if there was any interest, we had our first meeting in October 1996. Between 15 and 20 people came that first Friday. Everyone who showed up that day, who was interested, became a member of the first board. By January we had more than 30 people. And the rest is history. Reluctantly, I was elected the first President. Thanks to having a great board, we became organized. From the first year, we were doing quilts for Aids babies. The workshops were started to teach each other and work and laugh together. We laughed a lot those first couple of years. The Village Quilters has been a wonderful experience for me and I hope to keep on quilting and learning.